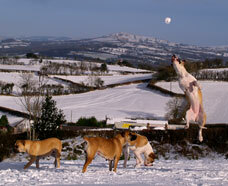 Welcome to boerboels.co.uk! - We set up this website a number of years ago as an information source for people interested in this breed of dog as we ourselves went looking, and found that there wasn't anything available for people in Britain. Since then, we've learnt a lot. We've travelled, met people - some good, some not so good! 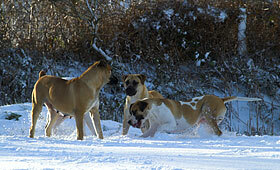 as well as lots and lots of Boerboels and of course now we have them as family members of our own. We've also been observing the development of this breed in the UK. Things have happened that are good and positive, but there have also been other issues that are disheartening. Fortunately, a small number of people are indeed pursuing the goal of maintaining and improving this fantastic dog through responsible and ethical breeding. While we are still an average couple with only a few pet dogs, we have decided to do our small part in joining this group, hence we've registered the name Accolade Boerboels and we'll hopefully, every now and again we'll have some very nice puppies which will give others as much pleasure as our girls have given us. We hope you like the new site and find it even more useful and enjoyable than the original. Boerboels are a mastiff type dog, originating from South Africa. They have been bred specifically as a farm watchdog who has a superbly even temperament, they make wonderful companions. The Boerboel is generally obedient, intelligent, self-assured and has an extremely strong guarding instinct. 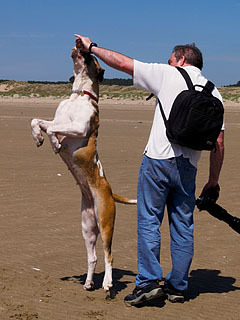 Perhaps surprisingly, this does not make the dog a vicious unsociable animal, because the Boerboel was and still is in constant proximity to the farmers and their children, a badly behaved or aggressive dog was unacceptable and would, perhaps some would consider, rather harshly, have been put down. This very selective and practical breeding ethic has created a loving pet with an even temperament that is happiest in a family environment, where he can put his watchdog instincts into action when required. Boerboels are not born with all the information they need to live among us humans, please remember as an owner it is your responsibility to raise, educate & care for your dog. Currently, about three or four times a year we send out a 'mini-newsletter' telling people what's happening with us & our dogs as well as the Boerboel Community in general. To join simply fill in the boxes below, with your full name, the county you live in & most importantly, your e-mail address! And don't worry,we won't give your e-mail address to anybody else unless you ask us to. If you only buy one book, buy this one!